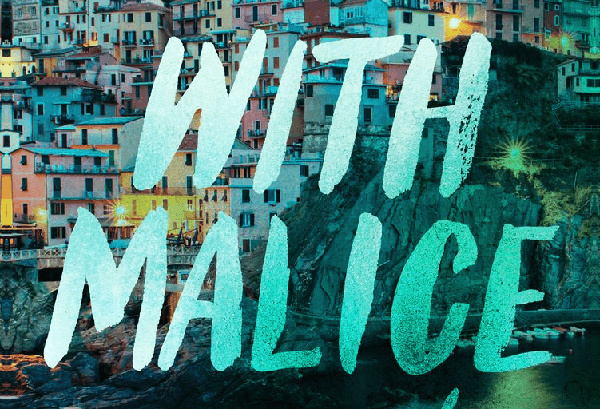 With Malice is a young adult novel about eighteen-year-old Jill Charron, who wakes up in a hospital bed after a car crash. She’d been in Italy with her best friend Simone and their car went off the edge of a cliff and Simone died.But Jill has amnesia and doesn’t even remember being in Italy. She certainly doesn’t remember the accident, and now she requires a press team and a lawyer because it looks like the accident wasn’t actually an accident, and Simone’s family think Jill deliberately drove that car off the cliff. This book is the perfect novel for a summer holiday read, or when you feel like reading something easy. I read it in one sitting and I was very absorbed in the book. The classic ‘did she do it?’ storyline was enough to keep me entertained. The story moves at a fast pace and slowly, through interview transcripts and the occasional flashback, you find out about Jill’s time in Italy over the summer. The reader starts to receive conflicting bits of information. Simone’s parents give different information to their classmates, and the tour guide reveals things about Jill and Simone that Jill can’t believe they did. The reader starts to question what is the truth and what is a lie. The story of Jill’s car crash makes the news and Jill becomes the centre of a murder investigation. The media is portraying her as a sociopath who killed Simone in a jealous rage. Evidence starts mounting, but Jill still can’t remember the summer and she doesn’t believe the things that people are saying about her. Jill works to piece together the previous two months and work out who is responsible for Simone’s death. Eileen Cook has crafted a story where the reader begins to suspect everyone of something. Jill’s hospital roommate could be suspicious – so could her father. Or perhaps it’s the man who Jill and Simon both fell for on their Italian summer holiday? Also, With Malice is not just written in prose. Eileen has filled the book with interview transcripts, holiday guides, flashbacks, and news headlines and news articles. This forces the reader to concentrate on the information being given to them, because there are subtle clues being delivered in those chapters. This is a great thriller novel for younger readers. It’s a short novel and the chapters are broken up with different styles of writing, so it’s easy to read for those not yet confident enough for adult thriller novels. There are a lot of surprises in With Malice to keep the reader guessing and to keep them interested in finding out what happened. I thoroughly enjoyed this novel and would highly recommend it.